You are here: Home / CFL/League / Review of the “New” BC Lions jerseys and a great deal on a pro-stitched jersey! Review of the “New” BC Lions jerseys and a great deal on a pro-stitched jersey! 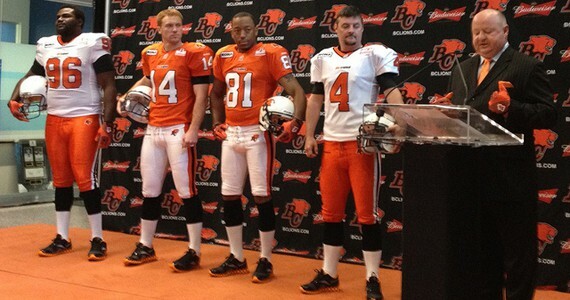 The BC Lions introduced their new jerseys on Wednesday and in this case the Lions felt it was a case of why change a good thing? The only real design change to the newest threads is the removal of the black piping that ran from the shoulders, across the chest. The Reebok branding is different with the logo gone and the company’s name on each shoulder over the numbers. The quality is higher end, the material is different and the jersey has a different fit. The BC Lions logo on the shoulders is now a sewn on patch. A big upgrade over the screened only option fans had with previous editions. When Bob Ackles returned the to Lions in 2002, he felt the team had lost it’s identity. One of the things he wanted to change was to bring back orange as the dominant colour of the team’s uniform. Club president Dennis Skulsky alluded to the fact that the Lions think their look is pretty good, so why mess with it? The team will be looking at redesigning their popular black third jersey with an eye for a 2013 debut. Overall as a fan I’m happy that the look didn’t change drastically. I think the Lions uniforms are clean and sharp. The numbers are easy to read and the colour scheme works. These are clearly an upgrade in quality, so I will definitely buy one. And boy do we have a deal for you! Our friends at Sports in Stuff in Chilliwack are taking pre-orders for the new jerseys and are offering a price of $179.99 for a pro-stitched jersey if you order and mention BCLionsDen.ca. Jerseys will take about 10 days to get customized once they’re in stock. Give them a call at 604-858-2614 or email them at rickandwendy@shaw.ca! Of course you can always drop in and see them at the store, located at the Chilliwack Mall, 45610 Luckakuck Way, in Chilliwack.